In the Fall of 1977 Sears introduced an 8-note Electric Resonator Chime supplied by Rittenhouse. This was followed by a Rittenhouse made 8-note longbell in 1978. These chimes sold well enough to keep spots in the Big Book until the summer of 1983. Low cost doobells were increasingly becoming a commodity, and as such they had a thin margin. 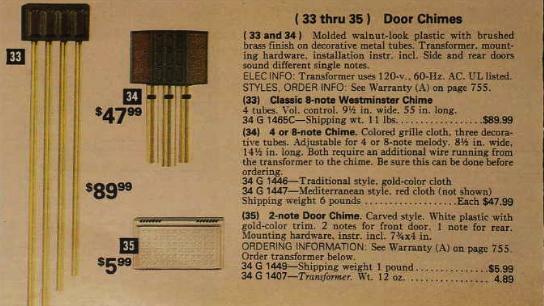 In the 1979 Fall Catalog, a simple white-box compact chime was featured next to a an 8 note Resonator and an 8-note long bell chime. In earlier “Big Book” catalogs, Sears had concentrated on lower cost, mass market chimes. In the late 1970s, Sears focused on higher end chimes with their higher profit margins since their was little money to be made at the lower end. Sears first wireless electronic door chime appeared in the 1989 catalog while white box “commodity doorbells” were left to home improvement centers. Meanwhile, the electronic revolution brought “doorbells” that were not really door “bells” at all as they relied on synthesized high-low chirps instead of the melodic percussion of actually striking metal bells or tonebars. Doorbells and Door Chimes were a casualty of Sears exit from the hard goods business that had begun in the late 1970. Sears Big Book and Wish Book Catalogs were themselves history by 1993, but not before Sears had sold millions of doorbells that delight Trick or Treaters to this day. Electronic chimes which produce a synthesized sound now dominate the lower end doorbell business. Their chief advantage is in their low cost, made possible by having very few movable parts. Wireless versions eliminate the need for house wiring by transmitting the signal from the button with radio waves. Wireless chimes reintroduce the need for batteries—one at the button and another at the chime—to function. Thus, wired chimes with their hard wired reliability, remain popular.